Working in E-commerce means that I’m constantly looking at the leaders in the retail industry. So I was really excited to win the Access All ASOS competition to interview one of their stylists. Of course I picked my fabulous friend Megan, her blend of 70s styling is right up my street. 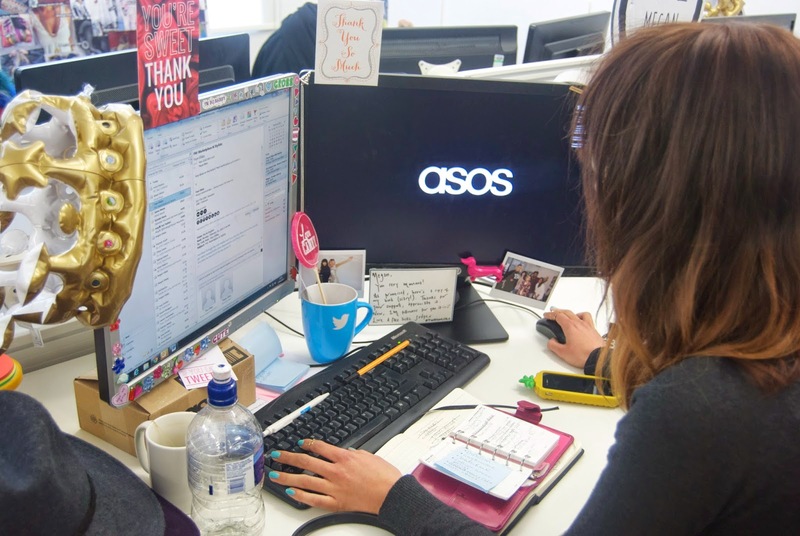 The stylists were meant to come and visit your home town but as I was in London for London fashion week I thought it would be a perfect excuse to have a little snoop around ASOS HQ. The first thing that struck me upon entering was how vast the office actually is. The office in Camden used to be a cigarette factory -interesting fact from Megan! I was shown around all of the various departments that make up the machine that is ASOS. I took a few snaps where I could, I wasn’t allowed to photograph in the buying department as there were lots of pieces which were yet to hit the site. I found that all of their photography and catwalk videos are shot on site. There are such a large volume of products that there are shoots going on everyday. These photos are all passed on to the re-touch department, to make them website ready. This whole process was really fascinating, the teams even have a wall in the office to show the process of getting a photo or video live on the site. We got to jump up on the catwalk and strut our stuff too! The ASOS stylists all sit together in their own little area, Megan tells me that they will all be moving to the top floor soon. They’ve made this area their own, with inspiration boards aplenty. It was really fascinating to have this insight into a market leader like ASOS. Make sure you keep an eye out for my interview with megan which will be coming up within the next few days. "London Fashion Week: Round Up"